U.S. Navy. Via Francillon (1979). The Nakajima Homare ("Honor") was an air-cooled 18-cylinder double-row radial engine. It used the same size cylinders as the Sakae (bore of 130mm and a stroke of 150mm.) Though somewhat mechanically unreliable, later models became increasingly important towards the end of the war. The engine was notable for having a relatively small diameter, which reduced drag. Also known as the HA45 and the [Ha-45] 11. Notorious for its lack of mechanical reliability. 1163 kW (6,550m) Also known as the NK9C and the [Ha-45] 12. Also known as the NK9H and the [Ha-45] 21. Known as Ha-45 in Army service. 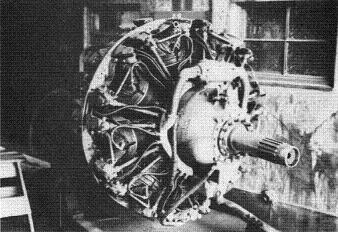 This engine powered the B7A "Grace", the C6N "Myrt", the Ki-84 "Frank", the N1K1 "George", and the P1Y "Frances".